It is all too easy to call a place a plant paradise. But, from a gardener’s viewpoint, there can be few more enchanting places than Caribbean islands. Stretching in an arc from the tip of Florida to the northern coast of South America, the Caribbean archipelago is a series of delightfully varied, plant covered islands. Practically all lie within the tropics and are blessed with warm weather throughout the year. Average annual temperature is around 25°C, sunshine hours are high and most islands have at least adequate rainfall. Coupled with deep fertile volcanic soil on many islands, conditions for plant growth are superb. While the beauty of many temperate plants can evoke wonder and admiration, tropical plants are even more inspiring. Their speed of growth, unlimited beauty and rich variety of colour and form put them in a class of their own. Most Irish gardeners are already familiar with tropical plants as many are grown in homes and conservatories. But the struggling pot-grown specimens of Codiaeum, Bougainvillea, Canna and palms in Irish living rooms, porches and lobbies of public buildings are very different from the same plants with their roots free-growing in warm moist soil and with their head in tropical sunshine. Many aspects of Caribbean plants are impressive. Above all there is the exceptional vigour of growth throughout the year and the marked difference in flora between islands. Dominica is almost completely covered with lush rain forest including gigantic tree ferns while near-by Antiqua is much more open with wild areas of Agave, Yucca and the Turk’s Cap cactus, Melocactus intortus. The difference is due primarily to topography and its influence on annual rainfall. Mountainous Dominica has an average of over 3,000 mm whereas low lying Antigua is drier, with an average rainfall of only 1,000 mm. During the wet season, moisture-laden winds drop most of their rain on the mountains leaving very little for the low lying islands. Even on one small island, the landscape may change dramatically within small areas as mangrove swamp gives way to banana plantation and coconuts replace brightly coloured tropical scrub. There are also interesting differences between the fertile acid soils of many volcanic islands, such as St Lucia, St Vincent and St Kitts and the limy soil of Barbados and islands formed from coral. On coral islands, many plants including Hibiscus and citrus are more difficult to grow because the high levels of calcium in the soil restrict the uptake of essential minor elements such as iron and copper. 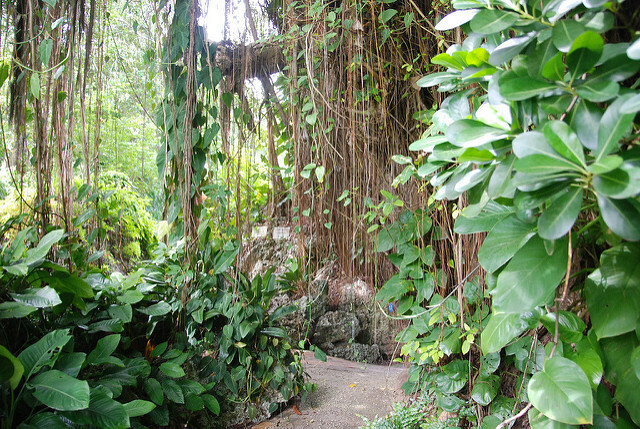 Despite this, magnificent gardens can be made on coral and the gardens of Barbados are among the best in the Caribbean . 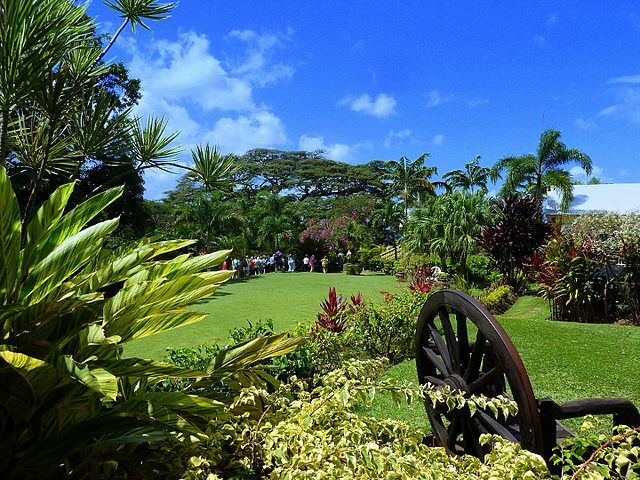 Enhancing the rich diversity of plants and landscape, many different types of gardens can be found all over the islands reflecting the region’s turbulent history. In contrast to Australia, New Zealand and many other New World countries where the cultivation of plants is a relatively recent development, the Caribbean Indians have been gardening for centuries. On his first visit to the Caribbean in 1492, Columbus recorded that the Carib Indians grew maize and beans in tiny gardens around their homes. Even earlier the Arawaks, the first known settlers in the region, lived well on a diet that included fruits, nuts and vegetables, such as pineapples, guave, cashew, maize, cassava and sweet potato. Small, highly productive gardens can still be seen on many islands particularly around certain villages such as Giraudel, known as the Flower Basket of Dominica. During the centuries following Columbus, other European explorers added further economic and ornamental plants to the rich Caribbean flora, the most notable introduction being sugar cane from the Far East . The wealth created by the export of sugar to Europe in the 17th and 18th centuries led to the development of luxurious plantation houses. Because of the drastic decline in the sugar industry, new uses had to be found for these magnificent homes with their lavish gardens and many are now open to the public. From the early days of the ocean voyages of discovery, Europeans recognised the potential value of tropical plants such as coffee, cinnamon and nutmeg. Many of these plants have their origins in different countries but were brought to the Caribbean by Portuguese, Spanish, Dutch, British and other voyagers. In the 18th and 19th centuries the general view in Europe was that nature and the colonies were there to be exploited. Colonies were regarded mainly as production farms for the mother country for crops that would not grow in Europe . This accounts for the haste to set up botanical gardens as test areas for plants that might be economically useful. The oldest Botanical garden was established in Kingstown, St Vincent in 1763 and many others followed. Today, with their work only partly done, many of these gardens are only shells of their former glory. 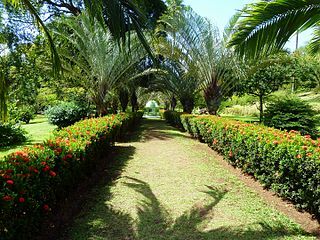 The once famous gardens in Grenada are now closed and little new planting has been done in the Gardens in Antigua to replace the numerous trees and shrubs destroyed by occasional hurricanes that can sweep the islands between late August and October. Fortunately excellent botanical gardens still remain such as Hope Gardens, Kingston, Jamaica ; the Jardin de Balata, Martinique and those at Kingstown, St Vincent and Roseau, Dominica . Further twists to the story of gardening in the Caribbean came in the 20th century. During this period, many wealthy people from Europe and the United States settled in the region on account of its healthy winter climate. Some were keen gardeners and they added a whole new layer of garden styles to the existing attractions. The latest developments are the many new gardens designed specifically to cater for the burgeoning tourist trade. Recent gardens include the Orchid World of Barbados which opened in January 1999, the stunningly beautiful Mamiku Gardens, St Lucia and the spectacular Montreal Gardens, St Vincent which is being developed in the fertile crater of an extinct volcano. All are outstanding examples of gardens made with the needs of demanding tourists in mind. Apart from a wealth of astonishing plants they also include coffee shop, toilets and are wheelchair friendly. This is arguably the most scenically spectacular of all the islands with lush mountain scenery and awesome peaks such as the twin Pitons that rise spectacularly from the sea. This island has also some of the most magnificent gardens in the whole region including Mamiku. In contrast to many of the old botanical gardens where there has been little new planting for decades, Mamiku was started only in 1997 after years of careful planning. The young age of the garden gives it a fresh and verdant appearance. Not only does the garden display a wide range of tropical natives but it is also home to temperate plants such as roses and hydrangeas. Among many noteworthy tropical plants are the red flowered banana, the Chalice vine, Solandri nitida, Red Flag, Mussaenda erythrophylla, the Orchid tree or Napoleon’s Hat, Bauhinia galpinii and numerous palm trees. 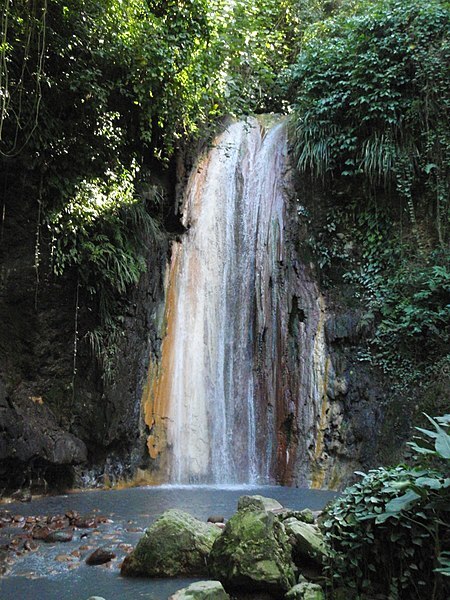 Another popular attraction on St Lucia is the Diamond Botanical Garden noted for its plants, sulphur springs and colourful waterfall. The sulphur springs arise from a weak spot in the earth’s crust and feed mineral baths. These were built originally in 1784 for the troops of King Louis XVI of France, so that his soldiers could benefit from the healing waters. Close to the baths there is a spectacular waterfall whose mineral-rich water changes colour – yellow, black, grey or green, several times a day – according to the minerals it contains. The grounds are now lavishly planted with a wide range of tropical plants so that in places visitors feel that they are in a dense rain forest, albeit with the luxury of good pathways. In places the different vegetative layers of a forest are well represented with tall trees such as coconut towering over citrus and nutmeg. Many contrasting features in the gardens provide variety and interest, such as attractive lawns around an open gazebo, rock garden, shady walks and wetland dell. 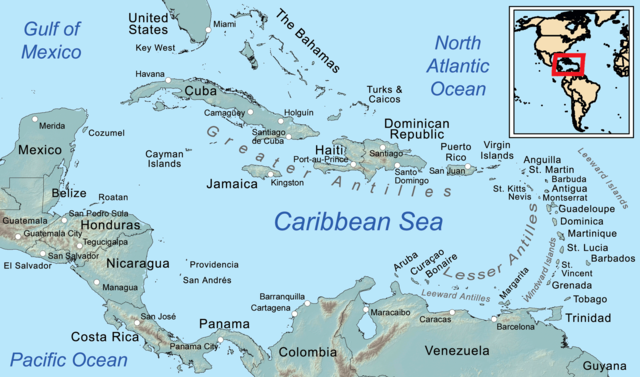 This is the most easterly of the Caribbean islands. Unlike many others, it boasts no spectacular volcanic peaks but instead has a gently undulating landscape with extensive sugar cane fields dotted with picturesque villages. The island is blessed with many first class gardens and, possibly because of the island’s close links with Britain, more of these are open to the public than on most Caribbean islands. Flower Forest is situated on a picturesque elevated site, near the western edge of the Scotland District. The garden has been made in the grounds of an old sugar plantation and the large sugar boiling vats near the entrance provide an historic link with the past. The gardens cover six acres and are planted with many colourful species, such as the Copperleaf, Acalypha wilkesiana, and the Crepe Ginger, Costus speciosus. But the whole garden comes together well as a luxuriant flower forest with winding main and side paths snaking through the luxuriant plantings. Orchid World of Barbados is a new 6.5 acre garden with tens of thousands of orchids in a beautifully landscaped setting. Each species is grown under the conditions that suit it best. This may be the open, either shaded or sunny, or in shade houses or under full protection so that the potential magnificence of each plant can be fully expressed. For example, many species of Phalaenopsis, Cattleya and Oncidium do not like rain and are grown under cover while hardier Vanda is grown in the open. New Francia is an elegant plantation house situated on fertile sloping land overlooking the picturesque St George Valley. The terraced lawns are spacious and show off many tropical plants to good advantage. The gardens contain a fine row of the Blue Trumpet Vine, Thunbergii grandiflora and a beautiful white flowered specimen of Queen’s Wreath, Petrea volubilis. Andromeda Botanic Gardens were started in 1954 by the late Iris Bannochie. Today they are managed by the Barbados National Trust and consist of a beautifully landscaped four acre garden that tumbles down a steep hillside among coral boulders. Small outdoor garden rooms, carved into the hillside, house collections of rare bromeliads, orchids, Heliconia and other colourful plants. The most impressive plant in Andromeda is the Jade Vine, Strongylodon macrobotrys, supported by a high pergola. One of the most spectacular of all green-flowered plants, it is festooned with long racemes of lobster claw like flowers during the dry season from February through to May. Also impressive is a hundred-year-old Bearded Fig, Ficus citrifolia, the tree that gave the island its name. A small water garden is well planted with water lilies and the sacred Lotus, Nelumbo nucifera, whose seed heads are beloved by flower arrangers. In contrast to Barbados, Grenada is a volcanic island, renowned for its lush green mountains and its production of spices including cloves, nutmeg. ginger, cinnamon and mace. Dawn Fletcher’s garden is noted for its Bougainvillea and Croton collections but many other colourful plants are also grown including Nerium oleander, Alamanda carthartica and Vanda orchids. The garden also contains an attractive Crape Myrtle tree, Lagerstroemia indica, easily recognized by its stiff, rod like branches that are directed upwards and its dense panicles of purplish pink flowers at the ends of the branches. Like Grenada, St Vincent is a volcanic island with rugged mountain terrain, steep narrow roadways, lush forests and small houses, many with beautifully planted surroundings. Montreal Gardens, now under new ownership, are being developed for visitors on a grand scale with many novel features being integrated with the best of the original amenities. The gardens are superbly sited – inside the fertile crater of an old volcano, whose rim provides an attractive backdrop to the gardens. In addition to the display of all the most popular tropical plants, Montreal Gardens are noteworthy for the skilful way ground cover plants are grouped according to their flower and leaf colour. Christened by Columbus as St Christopher (St Kitts for short) in 1493, this fertile island is volcanic in origin and has rich, fertile, lava-type soils. St Kitts does not have the same large areas of lush rainforest as Dominica but it has the distinction of being one of the few areas in the world where rainforest is expanding at present. Romney Manor Gardens were badly hit by Hurricane Georges in late September1998 but renovation started immediately the wind had dropped. Helped by the tropical climate and volcanic soil, recovery was rapid. The remarkable recuperative powers of tropical plants is well illustrated by the avenue of Royal Palms, Roystonea caribbea, which was almost leafless in October 1999 but had virtually made a full recovery by April 1999. Initially tourism in the Caribbean was based on the splendid scenery, sandy beaches and benign climate for most of the year. Forty years ago, only the wealthy could afford a Caribbean holiday, mainly island hopping by yacht. But travel costs have come down and tourist operators are now offering holidays that appeal to garden and plant lovers. Not all islands with superb gardens are good holiday destinations. The magnificent island of St Maarten, with its beautiful green, concave slopes, sandy, tortuous coastline and tax free bargains is home to many fine houses and gardens. But many residents, including Harry Bellefonte, have gone to St Maarten for privacy, their gardens are protected by high walls and are not open to the public. For gardeners interested in tropical plants, the Caribbean has many advantages. Health risks are much lower than in most other tropical regions and the practice of opening gardens to the public is well established. The gift of pineapple fruits from Indians on the island of Guadaloupe to Columbus on his second voyage in 1493 indicates the region’s long tradition for the exchange of plants and information – a tradition that looks set to continue.